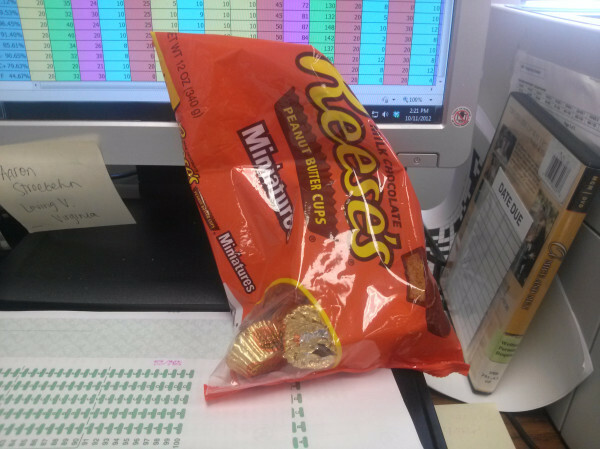 I buy a 12 ounce bag of Reese's Peanut Butter cups about once a week and you know I just power through them at work. I like to think that each one I eat gives me more energy and thus I move around a lot more and get rid of all the calories from the candy and THEN some. It's a nice thought, isn't it? Here's the thing with mini Reese's peanut butter cups. They're totally better than the big peanut butter cups. This is because the big peanut butter cups have too much peanut butter. They're bigger so there's more peanut butter in the middle and less of a chocolate perimeter. The mini Reese's peanut butter cups have the perfect ratio of peanut butter and chocolate. Don't believe me? Test it for yourself. And while we're talking about peanut butter cups, Hubs always gets mad at me for the way I say Reese's. I always says it "Ree- sees". He says it is pronoucned "Ree- suhs" and as an English teacher I should know better and be ashamed of myself for always mispronouncing it. He says I mispronounce it now on purpose because he's told me the correct way so many times. I wouldn't go so far as to say I mispronounce it on purpose, but I definitely don't make an effort to say it correctly. I guess I feel like that's part of my personality, and I don't want to make a conscious effort to change it. Hubs says that's Hogwash. Please say you understand. Now that we have talked extensively about Reese's peanut butter cups, I've got another peanut butter cup to introduce you to. Tess! (Too cheesy? Or should I say too peanut buttery...?) (Yah, I'm done with the bad jokes now.) There's a lot of reasons why I like Tess but the most important ones are 1. She is in a love affair with diet coke. Aren't we all? Aren't we all? 2. She uses words like BLAMO. Hello. You know someone has got to be awesome if they use a word like BLAMO, right?!? I'm so in love with my husband, it's gross. Like, school-girl crush. Like, a little bit obsessed. I'm also in love with Diet Coke (isn't that called an affair?). Literally addicted. The apple doesn't fall far from the tree, right? Thanks for that gene, mom. I guess you could call me a caffeine-addicted, husband-loving, crafting foodie/student who experiments with recipes, fashion, and comedy. And plays the ukulele and owns a chinchilla. Just to sweeten the deal (you remember the deal where you come look at my blog? ), I'm going to show you some really awesome stuff. Here is a collection of wildly unflattering pictures of myself. And here is a post with a secret that's no longer a secret. My blog is really interactive. 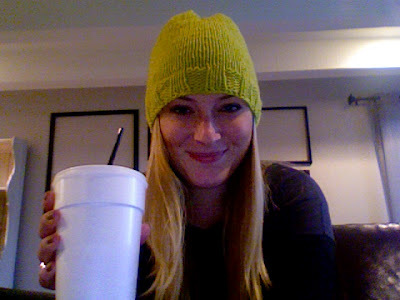 I do lots of forum-style posts, giveaways, and hilarious stories (narcissistic much?). I wasn't kidding when I told you I love meeting and interacting with new bloggers. I try my best to start actual conversations. You'll see questions like how often do you wash your sheets? and where's the worst place to have a bug bite? If all of that isn't enough to get you to come check out my blog, I don't know what is. i heart Ree-sees too...the new super mini's make my heart melt! Reese's can turn any bad day around! Now I'm craving them, ah! I say ree-sees. And I also call the M&M like ones Ree-sees pee-cees. I get made fun of a lot of that one. I'm all about the big ones...I shove the whole thing in my mouth...the Hubs just shakes his head :) When I'm in a crappy mood, I'm like, "OMG pleaseeeee go get me some Reese's!!" it is soo true! the mini Reese's are better. my favorite ones are the Easter egg shaped ones though! Okay so i am IN LOOOOOOOOOOVE with REE-SEES! The pumpkin shaped ones are my fave! Lmao!! I totally say reesees peeesees when I'm talking about any Reese's product lol! & yes, I concur that they're better than the big ones! Is it weird that I was just thinking the other day about how the mini cups are so much better than the normal cups?! Lol, I can only eat maybe two of the large cups yet I could probably pound half a bag of mini cups down in one day. I love that you buy a bag a week, that is awesome!! Mmm I love peanut butter cups! Peanut butter cups!!!! Enough said! You take the minis, I'll take the big ones - the more peanut butter the better! I misread it at first but I say Ree-sehs. I've never heard someone say Rees-ees before! I've NEVER heard it pronounced any other way! I feel so... hurt.. like this whole time I've been calling my best friend by the wrong name! My entire family says "ree-sees" and I agree, the mini reese's are way better than normal sized ones. I freeze mine, ever try that? It's good! Oh my gosh Bonnie, thanks so much for the feature! I love that you described me as peanut-buttery. Hilariously, I'm deathly allergic to peanut butter, and have never had Reese's. You are the discoverer of the Perfect Peanut Butter to Chocolate Perimeter Ratio. You can name it anything you like. This is your perogative as an explorer - tell him the name of the phenomenon is pronounced Ree-seez. The pronunciation of the mere brand is immaterial! Those mini peanut butter cups are DANGEROUS! I could probably eat a whole bag in one sitting if I wasn't careful!